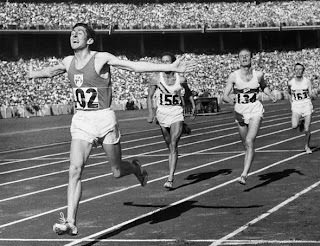 The fact that Ronnie Delany considered himself a half-miler until 1955, and that he had the finishing speed of an 880y man, explains a lot about his closing kick in the 1956 olympic 1500 final. The picture above captures the second when his chest hit the tape in Melbourne, but it belies the fact that Delany was at the back of the peleton with 300 meters (see below) to go and needed that closing speed to reel in those in front, including the home-standing world record holder John Landy. It was Ireland's first olympic medal in 24 years. In 2006, on the 50th anniversary of this historic victory, the Republic of Ireland honored Delany with his own postage stamp. With just 180 metres to run, Delany made his decisive move. His natural speed carried him clear to breast the tape in a new Olympic record of 3.41.2. 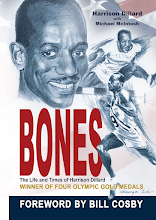 When he crossed the finish line with arms outstretched, Delany sank to his knees for a few private moments of prayer.